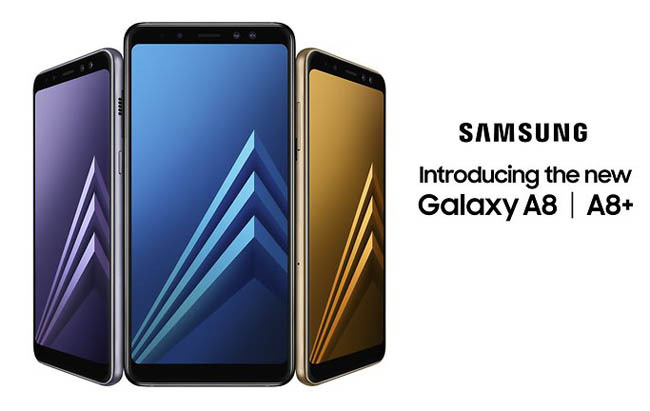 Samsung Galaxy A8+ (2018) is officially the company’s first phone for 2018 with flagship-like specifications. Samsung usually starts the year with the Galaxy A series launched, and around Feb-March, the new Galaxy S9 series flagship is revealed. The current Galaxy A8+ gets features from the previous year’s flagship as has been the trend in the past. For starters, there’s the Infinity Display, the face recognition feature. However, unlike Galaxy Note 8 which had a dual-rear camera, Galaxy A8+ sports a dual camera on the front. The Galaxy A series has always borrowed design elements from the flagship S series. The glass and metal design we have seen on the Galaxy S7 and Galaxy S8 series was also extended to the 2017 Galaxy A7, A5 phones. With the Galaxy A8+ this continues and it has the familiar rectangular glass and metal design with slight curved edges at the back. However, the Galaxy A8+ is a bigger phone with a 6-inch taller Infinity Display. The aspect ratio is 18.5:9 and Samsung has removed the physical home button from the front. Instead, the Galaxy A8+ has on-screen buttons. Take a glance at Galaxy A8+ and you’re sure to mistake it for the pricier flagship Galaxy Note 8. Well, at least from a distance. Having said that, the device has lost the curved edges on the display and, at 8.3-mm, it is less thicker than the Note 8. The fingerprint sensor has been moved to the rear but unlike Note 8 and Galaxy S8 Plus, it sits below the camera sensor. The camera lens and scanner combine to make for an interesting soda can pull tab-like design. Overall, the Galaxy A8+ looks quite premium for its price, though my only grouse would be that this is a fairly big phone. The Infinity Display might mean more viewing space, but I still struggle using devices with a 6-inch display. Personally, I would have preferred the smaller Galaxy A8, but that has not come to India yet.